Muscle spindles are skeletal muscle sensory receptors within the body of a muscle that primarily detect changes in the length of this muscle contributing to fine motor control and providing axial and limb position information to the central nervous system. The responses of muscle spindles to changes in length also play an important role in regulating the contraction of muscles, by activating motor neurons via the stretch reflex to resist muscle stretch. Proprioceptors are specialised sensory receptors that are located within joints, muscles, and tendons. As these receptors are sensitive to both tension and pressure, they play a role in relaying information concerning muscle dynamics to the conscious and subconscious parts of the central nervous system. They provide the brain with information concerning kinesthetic sense, or conscious appreciation of the position of body parts with respect to gravity. Most of this proprioceptive information is processed at a subconscious level, therefore we do not have to dedicate any conscious activity toward tasks such as maintaining posture or position of body parts. Golgi tendon organs (GTOs) are an example of proprioceptors. They are located in tendons near the myotendinous junction and are in series, that is, attached end to end, with extrafusal muscle fibers. A mammalian muscle spindle showing typical position in a muscle (left), neuronal connections in spinal cord (middle) and expanded schematic (right). Muscle spindles are small sensory organs with an elongated shape. They are proprioceptors that consist of several modified muscle fibers enclosed in a sheath of connective tissue. These modified fibers are called intrafusal fibers. 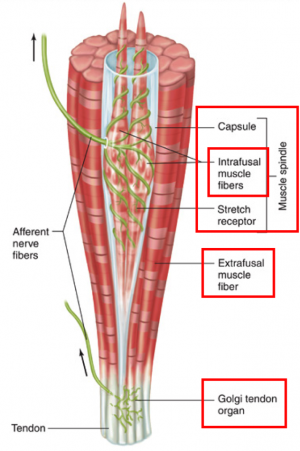 These fibers are oriented parallel to the regular, power-producing extrafusal muscle fibers. 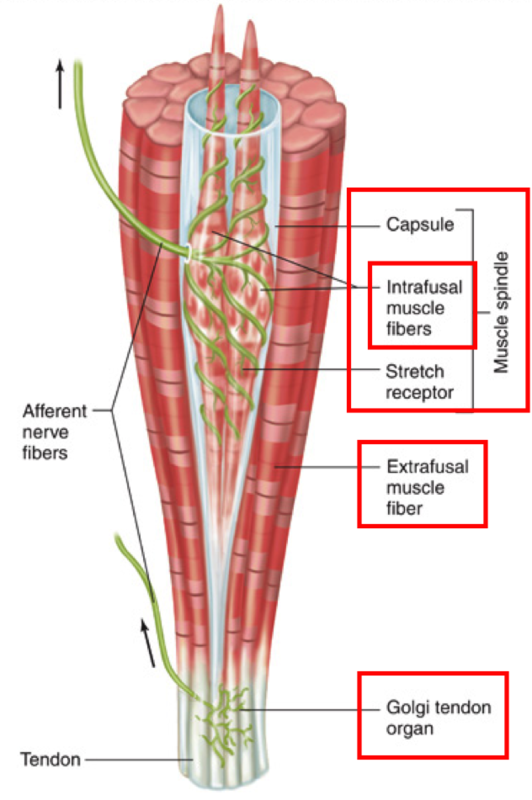 Intrafusal muscle fibers are at both ends connected to either tendinous ligaments or extrafusal fibers, namely contractile proteins . So, intrafusal fibers are stretched or shortened correspondingly, when extrafusal fibres change length. The central part of the muscle spindle is covered with a capsule of connective tissue. The sensory dendrites of the muscle spindle afferent wrap the central region. The muscle spindle is stretched when the muscle lengthens increase, this opens mechanically-gated ion channels in the sensory dendrites. This leads to a receptor potential that triggers action potentials in the muscle spindle afferent . There are two types of sensory endings found in muscle spindles: the primary and secondary endings of spindles, which are located in the middle of the spindle. The primary endings respond to its speed and the size of a muscle length change. They belong to the fastest axons as they are myelinated. They contribute both to movement and the sense of limb position. Secondary endings are only sensitive to length and not to velocity, so they contribute only to the sense of the position. These endings have smaller axons and thus slower conduction speed. Both endings in muscle spindles are very sensitive to low-amplitude changes in muscle length, especially if these changes occur at a high frequency. A spindle ending is located at the end of a neuron or an axon whose body is in the spinal ganglion . Muscle spindles stimulate reflexively a muscle contraction to prevent overstretching and muscle fiber damage, this is known as the stretch or myotatic reflex . While stretching the muscle spindle, an impulse is immediately sent to the spinal cord and a response to contract the muscle is received, for protecting it from being pulled forcefully or beyond a normal range. It is a very quick impulse, because the impulse only has to go to the spinal cord and back . 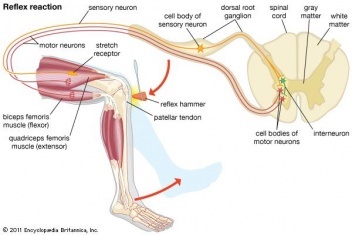 The stretch reflex has two components. The static component lasts as long as the muscle is being stretched. The dynamic component lasts for only a moment in response to the initial sudden increase in muscle length. The purpose of muscle spindles and the stretch reflex is to protect your body from injury caused by overstretching and to maintain muscle tone . This is a process that inhibits the stretch reflex in antagonistic pairs of muscles. 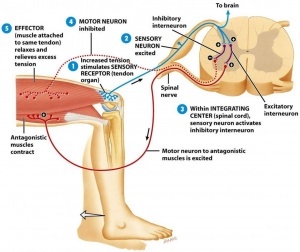 An impulse is sent from the stretched muscle spindle when the stretch reflex is activated, the motor neuron is split so that the signal to contract can be sent to the stretched muscle, while a signal to relax can be sent to the antagonist muscles . Spindles thus indicate the degree to which the muscle must be activated in order to overcome a given resistance. As a load increases, the muscle is stretched to a greater extent, and engagement of muscle spindles results in greater activation of the muscle. Muscles that perform precise movements have many spindles per unit of mass to help ensure exact control of their contractile activity. A simple example of muscle spindle activity is the knee jerk reflex (Patellar reflex), sudden kicking movement of the lower leg in response to a sharp tap on the patellar tendon, which lies just below the kneecap. Tapping on the tendon of the knee extensor muscle group below the patella stretches the muscle spindle fibers. This causes activation of extrafusal muscle fibers in the same muscle. A knee jerk occurs as these fibers actively shorten. This, in turn, shortens the intrafusal fibers and causes their discharge to cease. One of the most common positions that a health care professional will ask a patient to take for the test is to sit with knees bent and with one leg crossed over the other so that the upper foot hangs clear of the floor. The sharp tap on the tendon causes a stretch to the quadriceps. In reaction these muscles contract, and the contraction elicits knee extension or straighten the leg in a kicking motion. Exaggeration or absence of the reaction suggests that there may be damage to the central nervous system. The knee jerk can also be helpful in recognising thyroid disease. Unlike muscle spindles (located in parallel with muscle fibres), Golgi tendon organs are located in tendons near the myotendinous junction and are in series, that is, attached end to end, with extrafusal muscle fibers. Golgi tendon organs are activated when the tendon attached to an active muscle is stretched. As tension in the muscle increases, discharge of the GTOs increases. The sensory neuron of the GTO synapses with an inhibitory interneuron in the spinal cord, which in turn synapses with and inhibits a motor neuron that serves the same muscle. 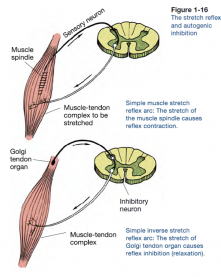 The result is a reduction in tension within the muscle and tendon.Thus, whereas spindles facilitate activation of the muscle, neural input from GTOs inhibits muscle activation. Problems may arise in the functioning of the muscle spindle. 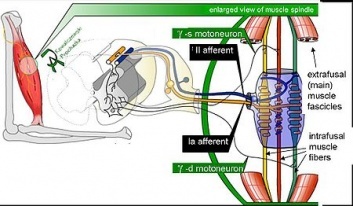 An upper motor neuron lesion can lead to a loss of supraspinal inhibition. A basal ganglia disorder can cause excessive supraspinal activation. If there is a problem with the muscles spindle it may present as abnormal muscle tone such as spasticity (a velocity dependent increase in resistance to passive stretch which causes exaggerated tendon reflexes called hypereflexia). There are several causes of spasticity associated with the muscle spindle. First, overactive input from gamma motor neurons or increased excitability at the central synapse can present as spasticity. This usually occurs due cortical damage and a loss of inhibitory impulses. Secondly, spasticity may be caused by problems with the renshaw cells. Renshaw cells are interneurons that are stimulated by the alpha motor neuron and then, by a feedback mechanism, inhibit the alpha motor neuron, causing auto inhibition. Problems with the renshaw cells lead to a loss of inhibition on the alpha motor neurons so they simply continue firing. Thirdly, spasticity can arise from a pre-synaptic inhibition of Ia afferent. Finally, it can arise from a neuro-related or structural change in the muscle fibers. It is often believed that dysfunction caused by strokes and movements disorders, such as muscular dystrophy, also affect the function of muscle spindles. For example, strokes are known to cause weakness, loss of dexterity, and exaggerated reflex response to proprioceptive and cutaneous stimuli due to problems with the gamma motor system. However current research shows that the gamma motor system is not responsible for the deficits of the skeletalomotor system. The discharge rate of muscle spindles in stroke patients was found to be similar to normal subjects. There was no difference in the reflex response to peripheral afferent inputs or in the response to supraspinal drive. Muscular dystrophy is characterized by the degeneration of skeletal muscle fibers. Research examining the affect of the degeneration on intrafusal fibers have found that the proprioceptive function of muscle spindles is spared in muscular dystrophy. Research confirmed that muscular dystrophy patients perceived passive movements and experienced illusory movements similar to those perceived by healthy subjects in terms of the movement direction and velocity. They also found that muscular dystrophy patients were able to respond with similar spatial and temporal movement characteristics when compared with the normal subjects. ↑ 4.0 4.1 4.2 4.3 4.4 4.5 Brukner P. Brukner & Khan's clinical sports medicine. North Ryde: McGraw-Hill; 2012. ↑ Young RR. Spasticity: a review. Neurology. 1994 Nov;44(11 Suppl 9):S12-20. ↑ Thomas RC, Wilson VJ. Precise localization of Renshaw cells with a new marking technique. Nature. 1965 Apr 10;206(4980):211-3. ↑ Wilson LR, Gandevia SC, Inglis JT, Gracies JM, Burk D. Muscle spindle activity in the affected upper limb after a unilateral stroke. Brain: A Journal of Neurology. 1999; 122: 2079-2088. ↑ Ciscar ER, Trefouret S, Aimonetti JM, Attarian S, Pouget J, Roll JP. Is muscle spindle proprioceptive function spared in muscular dystrophies? A muscle tendon vibration study. Muscle and Nerve. 2004; 29(6): 861-866.